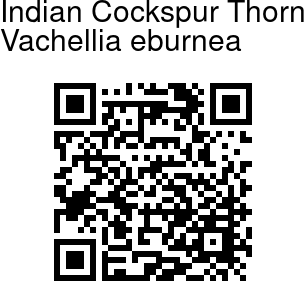 Indian Cockspur Thorn is a large shrub or a small tree, bark rough dark grey. Stipular spines straight, about 0.6-5.6 cm long, tapering from a broad base, white. Leaves are double-compound. Side-stalks are 2-8 pairs, about 6-13 mm long, leaflets 5-8 pairs, 2.5-3 mm long, linear, pointed to almost blunt, hairless. 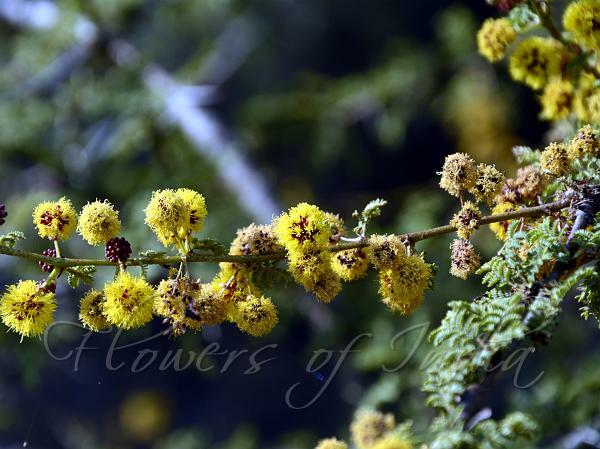 Flowers are borne in leaf-axils, in stalked spherical heads, bright yellow, smell disagreeable; flower-cluster-stalk about 2.5 cm long with involucre of fused bracts about the middle. Calyx is about 1-1.5 mm long, bell-shaped. Florets are about 2-3 mm long. Ovary stalked, hairless. Pod is stalked, 7.5-15 cm long, about 6-9 mm broad, flat, slightly curved, indented on both the sutures, longitudinally veined, hairless. Seeds 6-10. Indian Cockspur Thorn is found throughout India in dry regions, and in Ceylon, Arabia, and Afghanistan. Flowering: November-March. Identification credit: Siddarth Machado Photographed in Kadur, Chikmagalur, Karnataka.